Its that time of the year again. Fashion week. Amazon India Fashion Week 2017 took place in Delhi from March 15th to 18th, and there were so many new names that I loved this season. I really thought I was done with fashion weeks, the outfits often don’t make sense but when you have Indian handlooms being showcased on day 1, how can one resist. Day 1 Amazon India Fashion Week 2017 was a complete hit. I don’t know how much it was autumn/winter fashion…but I totally loved the outfits for summer as well. So here are some of my favourites listed for your pleasure. The theme this year was reviving traditional Indian textiles. Madhu Jains collection had beautiful sarees and salwar suits in ikat and patola prints. Her outfits to me had a very journalistic raw Indian feel to it. Her collection was the sole reason I decided to draft this post. I loved it. There were so many mix of colours and prints. Every outfit was a success for me. Madhu Jain has been in the fashion industry for the past 30 years, but this was her debut show at Amazon India Fashion Week 2017. Hers was one of the most versatile collections on Day 1 Amazon India Fashion Week 2017. From dhoti pants, to lehengas and anarkalis, this was the kind of fashion that I look out for fashion weeks. The collection called Parted Lips had beautiful floral prints in bold colours and a whole lot of metallics in the outfit giving it that oomph factor. 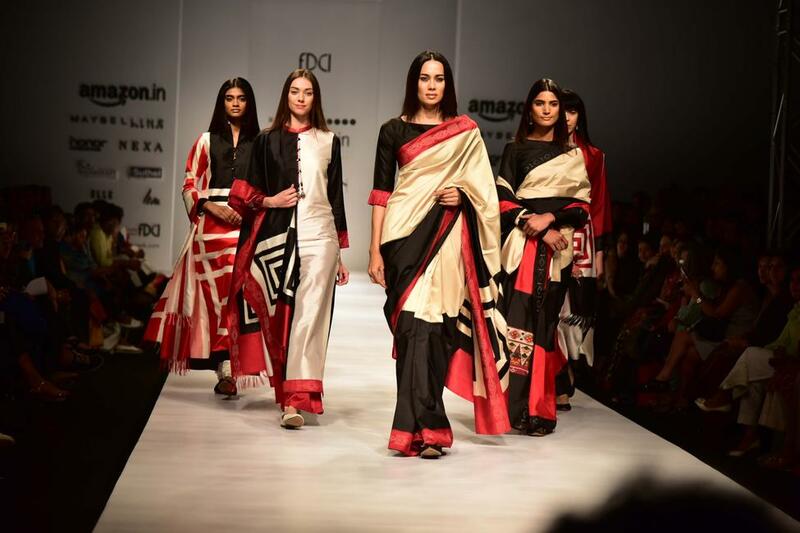 Jharkhand weavers were the highlight for this times fashion week collection, and designers like Shaina NC, Rina Dhaka, Dabri and more came together to revive the hussar fabric through their outfits. The show was focussed towards creating a means of employment for the weavers in Jharkhand. For any of you loving the whole ivory white, silver gold lehenga looks, this ones for you. I will keep an eye out to find out the prices so you know how much these beauties really cost. The lehengas look classy and elegant for any wedding day functions. This gorgeous red black saree by Shaina NC has to be by far my most favourite outfits from Day 1 Amazon India Fashion Week 2017. I don’t know what is it about this saree, but everything about it is so perfect. The blouse looks gorgeous, and the saree drape is just fantastic. I love that the blouse almost gives a crop top feeling, so even though the pallu hasn’t been draped in the traditional manner, the saree still gives out a very elegant feel to it. Sarees totally ruled on Day 1 Amazon India Fashion Week 2017 and I am so glad to see the traditional outfit making such a style comeback. All the designers have made it look so stylish yet stuck to the heritage, and bonus is definitely knowing that the outfit designs are going to be an income source for thousands of weavers all over the country. Which outfit was your favourite?